You might know about the Missingno glitch from Red & Blue, that backwards L shape that players could encounter and catch despite not being a 'real' Pokémon. You might even know about the infamous Mew glitch. But these aren't the only creature-related glitches you can find in Pokémon, amazingly enough. Glitch Pokezine is a collection of works curated by Jordan Rosenberg and Iasmin Omar Ata, and it features all sorts of artists. Most of the artists have contributed their interpretation of "glitch Pokemon" in art, or they've whipped up some of the lesser-known glitch Pokemon. The Johto guard glitch is a glitch in Gold, Silver, and Crystal which allows players to trade a Generation II Pokémon into a Generation I game as an equivalent glitch Pokémon or Generation I Pokémon by using a ????? (FF) (index number 255). It's through glitch trainers that you can even battle Professor Oak in the original Pokemon games, and he carries a Tauros, an Exeggutor, an Arcanine, a Gyarados, and a starter Pokemon. Bulbapedia hypothesizes that Oak might've been intended to be the champion at one time during development—which is kind of cool to think about. I'm glad they went with Blue, though—nothing beats that rivalry! It is a "sibling" to Missingno. because they look similar and both cause the item duplication glitch. I was fascinated by glitches in Red/Blue but I was scared to death of ever actually running across 'M due to the (untrue!!) rumors that catching it would destroy your game! I eventually got brave enough to try it out, but I freaked out as soon as it evolved into a Kangaskhan and immediately tossed it. This guy also (temporarily) put a Mew in my Hall of Fame during a time where there was no real known way to catch one! I stared at it for hours. Good memories associated with glitches! When a Trainer uses any variation of ???? ?, it will borrow the last sprite used in the battle area. This can be the original Trainer that appears before the battle starts, or another Pokémon that has been switched out. Unlike some variants of ????????? ?, all of the ????? glitches have Pokédex data which is undefined; however, all of the ????? glitches have a footprint…identical to that of Donphan. My take on ????? 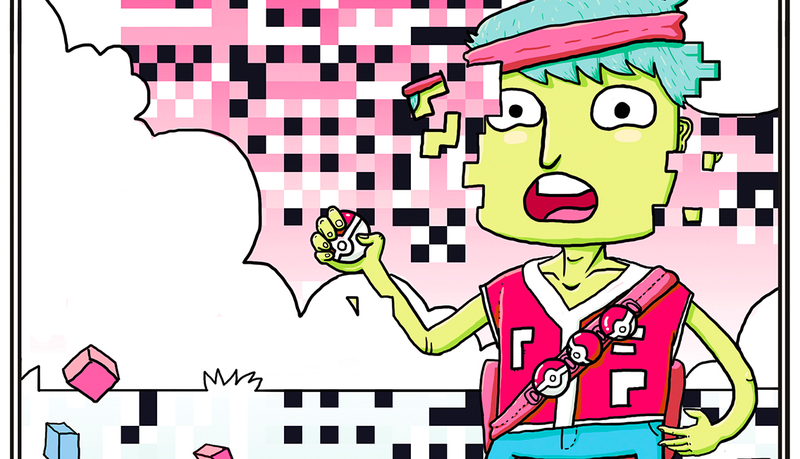 for the GLITCH POKeZINE, available soon. For rosenbergjordan's latest Pokézine based on all of the Glitch type Pokemon! I picked 8B_4_8 from the list, which is a very odd but cool Pokemon. 23' tall, more than 1,000 lbs, only found in Yellow. It's obtained by using the Johto guard glitch with Jumpluff, and has the cry of a Rhydon in its Summary, but the cry of Vaporeon in battle. Oh and in battle (if it hasn't already crashed the game) it remains in a permanent state of being frozen. I ended up working on three portraits and then printed them out and cut them up and wove them together! I like the portraits separately too, so I wanted to include them! :: My submission to the upcoming Glitch Pokezine curated by Jordan Rosenberg. Check out under the cut for info about the inspiration behind this crazy thing. [the pokemon] is a really cool glitch pokemon obtained through forcing a Noctowl into Red/Blue with the Johto Guard Glitch. It's a normal/flying type, and it's pokedex entry on file is pretty spooky. I ended up watching the First Movie and was super interested in exploring the idea of a gene splicing Team Rocket experiment gone horribly wrong. Considering that this pokemon can cause your game to enter a never-ending glitch song until reset, it must be trying to warn you about how it got this way, right? Obviously, there are a bunch more glitch Pokémon out there—and you can check some more of them out by browsing Tumblr's tag for the glitch zine. Otherwise, keep an eye on on this site—the zine, which features 68 different artists, is "coming soon".